We all know that kids say the darndest things. Now, it turns out that they will also do the darndest things... to buy alcohol, that is. 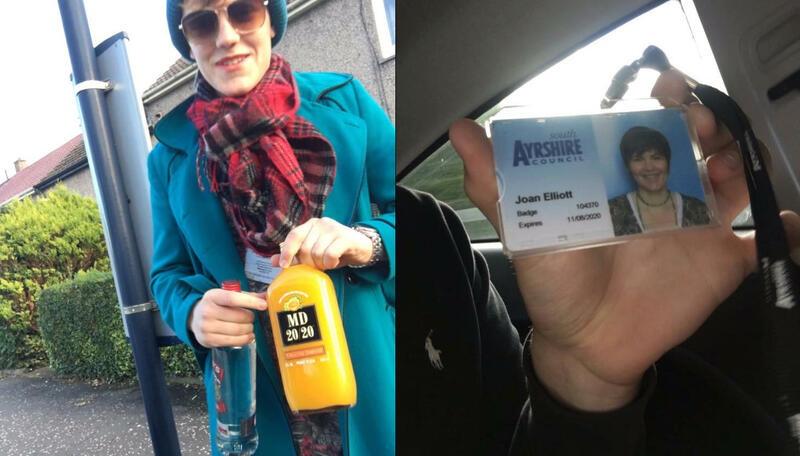 Last week, pictures surfaced on social media of a teenage boy in the U.K. dressed up in a cerulean hat, woman’s jacket and plaid scarf in an apparent attempt to mimic his mother’s look and -- more importantly -- successfully purchase alcohol while underage. The goal, it seems, was to obtain a bottle of vodka and a bottle of Mad Dog 20/20, which is a flavored wine drink. The impression is that the teen’s friend documented the event. Consequently, the tweet below went viral. It has gotten more than 22,000 retweets and 41,000 likes in less than a week. Now, countless Twitter and Facebook users are posting the original pictures in an attempt to go viral themselves. And for many of them, it’s working, scoring them thousands upon thousands of retweets. The overwhelming majority of these retweets appear to find the teen’s antics comical. There is, however, also the illegal element of this stunt. Unlike the United States, the legal drinking age in the United Kingdom is 18. So, teenagers there have a comparatively much shorter period of time to wait before they can legally purchase and consume alcohol. The hope, of course, is that they will do just that: wait... no matter how well they can impersonate their mothers.